Maryland is defined by its scenic waterways and 31 miles of coastline on the Atlantic Ocean and magnificent Chesapeake Bay. 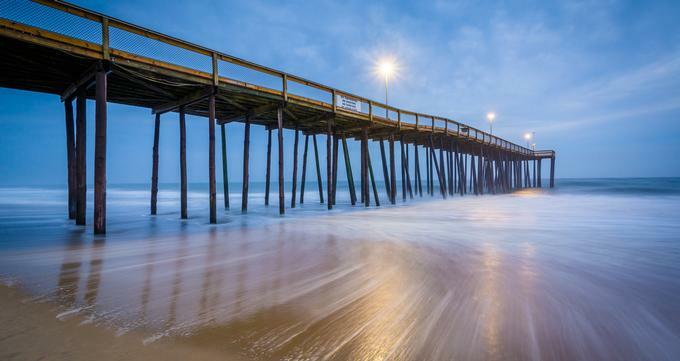 The coastline is dotted with small sandy beaches, but for serious waterfront fun, Marylanders go to Ocean City, Sandy Point State Park, Assateague Island, and North Beach. For those who prefer to enjoy their beach time in peace, there are many parks with isolated stretches of sand, such as Hart-Miler State Park on uninhabited Hart-Miller Island. 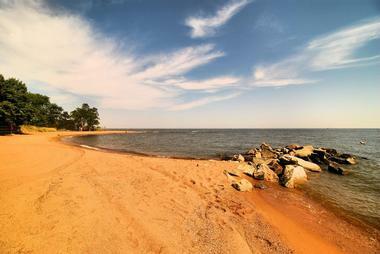 Some of Maryland’s best beaches are not on the ocean but on riverbanks or one of many scenic man-made lakes, such as Cherry Beach on the Nanticoke River or Rocky Gap State Park Beach on Lake Habeeb. Maryland's only park on the oceanfront, Assateague State Park is a beautiful barrier island famous for its 2 miles of sandy beaches, enormous diversity of birds, and magnificent wild horses. The park is located on the 37-mile-long Assateague Island, between Sinepuxent Bay and the Atlantic Ocean. The beach is great for swimming, sunbathing, beachcombing, fishing, and surfing and the interior of the island is crossed with shady trails great for exploring on foot. There are also small secluded coves to explore in a kayak or a canoe. The diverse and unspoiled environment provides a home to many animals besides the famous wild horses, such as deer and many kinds of water birds. There is a campsite on the bay side of the island. A famous beach resort town in the late 1800s until the early 20th century, Betterton was the place to see and be seen during the hot summer. Lovely stately homes were perched on top of the hill overlooking the ocean and the luxury hotels were buzzing with life. The village is now mostly a retirement community, peaceful and quiet, with a lovely beach at the bottom of the village hill overlooking Chesapeake Bay. There are still a few lovely Victorian homes left, but the big hotels are gone. Betterton Beach Waterfront Park stretches along the shore, at the point where the Sassafras River enters the sea, with 5 miles of beautifully landscaped area, a bath house, a picnic pavilion, benches in the shade of old trees, and picnic tables near the water. Located near Lusby, Maryland, on the end of the Calvert Peninsula in Chesapeake Bay, Calvert Cliffs State Park is named for the famous massive cliffs that dominate this 30-mile-long portion of the Chesapeake shoreline. The entire area is known for the fossils from 600 species from the Miocene sub-epoch. This popular public recreation area is nicely forested and has a small pond and some verdant wetland areas. There are 13 miles of hiking trails and the lovely sandy beach is located at the end of a 1.8-mile-long trail. Besides being popular with fossil hunters, the area is also frequented by birdwatchers, who can enjoy spotting more than 160 species of bird. Located in Sharptown, about 15 minutes from Salisbury, on the shore of the upper Nanticoke River, Cherry Beach is a lovely piece of land originally donated to the town by A. W. and Ida Robinson for public recreation. Today, the popular park has a fishing pier, a boat ramp, a big picnic pavilion with picnic tables, and a nicely maintained beach area. During the last renovation in 2009, the park got a kids’ pavilion and a pleasant walking trail that links the beach area to Cope Bennett Park. Cherry Beach is a popular place for families to spend a warm sunny day enjoying the nature of the Nanticoke. Pets are allowed on the beach. Close to Washington, D. C., near Thurmont in the heart of the scenic Catoctin Mountains, Cunningham Falls State Park is a popular place for the city folks to spend a weekend surrounded by nature. Divided into two distinct and separated areas, the park has a lake, falls, and camping in one, and the Scales and Tales Aviary, an historical iron furnace, and camping in the other area. 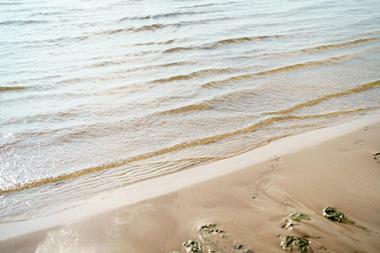 A small, man-made lake has a nice beach perfect for a cooling swim, fishing, or canoeing. There are shady hiking trails going in all directions, whether you want to see the remnants of the old iron furnace or prefer to visit beautiful Cunningham Falls, the largest cascading waterfall in Maryland. Deep Creek Lake, with almost a mile of scenic shoreline, is the largest Maryland inland body of water. Covering about 3,900 acres, this man-made lake is great for fishing and birdwatching. 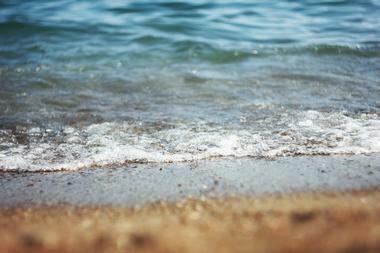 Swimming on the sandy lakeshore beach is great during hot summer days. The lake was created in 1920 as the result of the damming of Deep Creek. Today, the lake and the dam are part of Deep Creek Lake State Park. There is a public access boat ramp, and anglers come in large numbers looking for largemouth, smallmouth and rock bass, northern pike, and other fish species. Greenbrier State Park is located near Boonsboro on the slopes of South Mountain and is best known for the portion of the Appalachian Trail that passes through it. The park has a nice 42-acre man-made lake with a lovely beach for swimming in the summer. Canoeing, fishing, and hunting are also popular. There are many smaller trails running through the park that connect to the Appalachian Trail. There is a simple, rustic camping area as well as a picnic area with picnic tables and benches. The nearby park office offers maps of the park for those wanting to explore the network of trails. Located within Gunpowder State Park, Hammerman Beach is a day use area with a popular 1,500-foot-long sandy beach on the Gunpowder River. There is a lifeguard on duty during the season. The popular family outing area offers kids’ playgrounds, picnic pavilions, kayak and canoe rentals, and a concession area. Fishing is popular, and many anglers come to try their hand. There is also a boathouse and the Riverside Grille if you get hungry as well as a short and easy hiking trail. There is a fee for the use of Hammerman Beach and access is limited because of the small parking area. Hart-Miler State Park is located on uninhabited Hart-Miller Island in Chesapeake Bay. This 1,100-acre island, located near the mouth of Middle River, can be accessed only by boat. Safe mooring is located on the western shore, near the 3,000-foot-long fine sandy beach. The park also includes Pleasure Island and Hawk Cove. There are several campsites, which are especially popular with passionate anglers. The south cell of the park has more than eight miles of hiking trails that run around a large, clear pond, offering spectacular views of Chesapeake Bay. The popular 1.8-mile Long Trail Loop has a number of interpretive signs about the park’s wildlife and ecosystems. Janes Island State Park is located on the Eastern Shore of Maryland on Chesapeake Bay, not far from Crisfield. The park has a mainland area with the conference center, pavilions, picnic areas, a large campground, and rental cabins. There is also a marina and a public boat ramp. Janes Island, also part of the park, covers 2,900 acres of mostly saltmarsh. It has more than 30 miles of well-marked water trails through the marshes, perfect for exploring in a kayak or a canoe. Peaceful and isolated, the island feels as if it’s miles from the civilization, unspoiled and tranquil. It is heaven for water birds. The island has miles of almost deserted sandy beaches. Swimming is permitted only on the Tangier Sound side, where the beaches are accessible by boat only. There are no lifeguards on duty. About 50 miles from Baltimore, Matapeake Beach on Kent Island is best known as the Dog Beach, one of very few where dogs can romp in the shallow water and run along the sand. The beach is located on Chesapeake Bay’s east side and offers wonderful views of the Bay Bridge. The beach is part of Matapeake State Park, which also has a public beach for people, where pets are not allowed. There is also an historic clubhouse, an amphitheater, a fishing pier, a nice picnic area, and miles of hiking trails through the island’s wooded area. 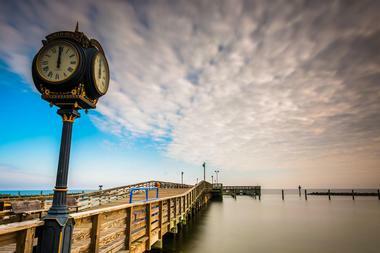 North Beach is a small Maryland coastal town on the shore of Chesapeake Bay, about 30 miles from Annapolis. The town stretches over seven blocks of waterfront, with a popular fishing pier and a long boardwalk. The boardwalk has a separate bike path and is lined with benches that are perfect for relaxing and enjoying the view of Chesapeake Bay. There is a fee for using both the beach and the fishing pier for non-residents. Paddleboards, kayaks, and bikes are available for rent, as are beach umbrellas and chairs. The town’s gift and antique shops are walking distance from the beach, should you have had enough of the sun. From May to October there is a popular Friday night farmers market. Point Lookout State Park is located on a peninsula between the Potomac River and Chesapeake Bay. During the Civil War, the park was the location of a notorious prison camp that held more than 52,264 Confederate soldiers. 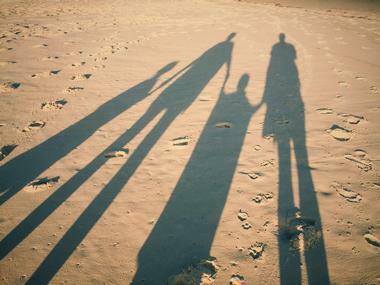 Point Lookout is a popular family holiday destination for folks from the Washington, D. C., area. There is a boat launch, a range of campsites in the park’s shady wooded areas, picnic areas, kids’ playgrounds, and great swimming on the beach. The park is popular with anglers and there are three great fishing areas, including the 710-foot fishing pier. There is also a network of hiking trails and the Marshland Nature Center. Located near Flintstone in a mile-long gorge surrounded by sheer cliffs with spectacular overlooks, lush hemlock forest, and more than 278 campsites, Rocky Gap State Park is 3,000 acres of magnificent wilderness. In its heart is beautiful, clear 243-acre Lake Habeeb, supplied by water from the Rocky Gap Run. The park also has the unique Scales and Tales Aviary, a nature center, a wonderful private swimming beach, a kids’ playground, and access to a network of hiking trails. Kayaks and canoes as well as paddleboards can be rented in the park. There is also a Snack Shack and a small camp store for the necessities. Pets are allowed in some areas. Located on the northwestern shore of Chesapeake Bay, Sandy Point State Park covers 786 acres of scenic green area with wonderful beaches, well-managed picnic areas, and spectacular views overlooking Chesapeake Bay. The park was opened in 1952 and has been a popular family destination ever since. There is a lot to do in the park, starting with swimming, fishing, boating, hiking, camping, and wildlife watching. There is a marina with boat rentals for those who like to spend some time cruising the waters. With a large number of water bird species, the park is very popular with birdwatchers, especially since the park is on the Eastern Flyway of migratory birds. 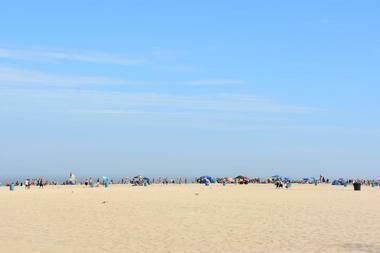 A part of the South Beach has a lifeguard on duty during the season. The nearby boathouse offers showers, restrooms, and snacks. Newtowne Neck State Park is located on the 776-acre peninsula between St. Cements Bay, Breton Bay, and the Potomac River. It has 7 miles of waterfront and is managed by the Department of Natural Resources, which has the goal of protecting the area from development. The park area was home to the Piscataway Native Americans until they were displaced by the white settlers. The park area is designated as an historic district and is registered on the National Register of Historic Places. The park has significant forest area, diverse wildlife, and public access to the Captain John Smith National Historic Trail. There is a network of hiking trails, great for observing diverse plant species. Fishing is permitted in the designated areas. 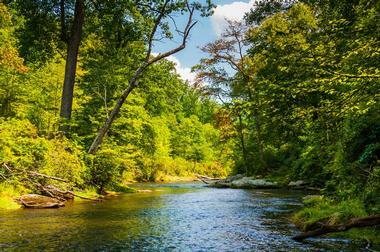 Gunpowder Falls State Park is one of the largest state parks in Maryland, formed in 1959 to protect the magnificent Big and Little Gunpowder Falls as well as the Gunpowder River. Divided into six distinct areas, the park covers 18,000 acres of diverse ecosystems, ranging from rugged slopes to tidal wetlands. The park has over 120 miles of hiking, biking, and horseback riding trails, the Wildlands Loop, fishing areas, and significant historic sites. It is great for kayaking and canoeing, and a small but nice swimming beach provides a cooling dip during the hot summer months. There is also a marina. The park is very popular with anglers as it is known for great trout fishing.